“I’ve always told people I enjoy corporate law and tribal/federal Indian law because there’s so much potential for creativity. Here is no different,” she continued. “When you can’t accept the word ‘no’ because your client’s lives and well-being are depending on ‘yes,’ then you find alternate routes to arrive at that ‘yes.’ However long it takes.” Rising 3L Ana Laurel talks about her work with Rural Summer Legal Corps and her journey to ASU Law. Read full ASU Now story. 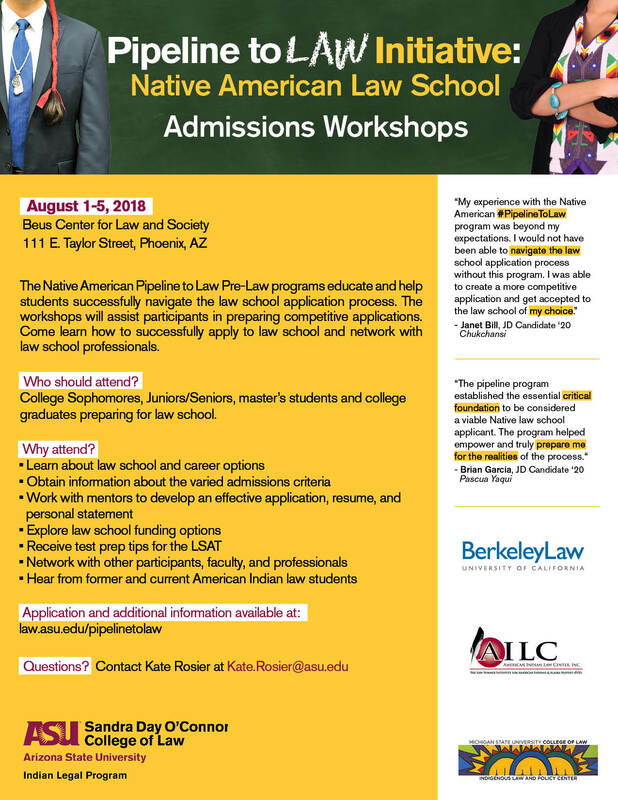 This summer the Native American Pipeline to Law team will host a 5-day session to help students better understand the law school admissions process at University of Washington School of Law in Seattle, Washington. Housing provided and a limited number of LSAT Prep courses will be available for participating students. Space is limited, register soon! Phoenix, Ariz. – May 17, 2018 – The Indian Legal Program at the Sandra Day O’Connor College of Law at Arizona State University is pleased to announce its new partnership with the National Congress of American Indians (NCAI) to produce a monthly podcast. ASU Law alum and Senior Counsel at NCAI Derrick Beetso, will work with the Indian Legal Program (ILP) team to produce a free and educational podcast on federal Indian law and policy. Titled “The Talking Stick: A Native American Law & Policy Podcast presented by NCAI,” the first podcast is scheduled to launch next month. For full press release, click the following link: Press Release NCAI-ILP Partnership. We are currently seeking volunteers to role-play witnesses and jurors for a mock trial that takes place during Tribal Court Trial Skills College. This event is volunteer-driven, so your participation is highly valued. Volunteer Jurors will be needed on Tuesday, June 12 (1:00-3:00pm). Jurors become familiar with a short description of the character they will role-play and then they participate in a jury selection simulation. Volunteer Witnesses will be needed on Wednesday, June 13 (3:30-5:30pm) and Thursday, June 14 (10:15am-3:15pm). Witnesses become familiar with the facts of a case file and a description of the testimony they will be expected to give. They then role-play a witness during a mock-trial simulation. If you are interested in volunteering or have any questions about the requirements, please contact Helen Burtis at hburtis@asu.edu or 480-727-0420. Come join the Federalist Society and the Native American Law Students Association (NALSA) tomorrow, April 3, at 12:15 pm in Room 644 for a lively panel discussion on a hot topic in Indian and Constitutional law: The Indian Child Welfare Act. The panel will focus on the Indian Child Welfare Act, its challenges, and its rationales. April Olson—Rothstein Donatelli in Tempe. LUNCH will be provided! We hope to see you there. Professors Lance Morgan and Robert J. Miller will be speaking at upcoming conference, “All Roads Lead to Chaco Canyon: Revitalizing Trade Between Native Nations” March 23-24, 2018. For details go to https://law.arizona.edu/native-trade. SOS – Call for National NALSA Moot Court Competition Judges! Arizona Attorneys and Tribal Court Judge Friends: SOS! Are any of you interested in judging a few NALSA Moot Court oral argument rounds? The arguments will be at ASU Law in Phoenix. We will provide the bench brief and sample questions. Times needed are Friday at 3:45, Saturday at 8:30 and Saturday at 10:30. Please let me know and I will connect you with my awesome students! Thanks in advance for your help!! Contact kate.rosier@asu.edu. Documentary Screening: More Than A Word in W.P. Armstrong Great Hall at 6pm. Following the documentary will be a closing panel that include Amanda Blackhorse, Representative Eric Descheenie, and Kyle Mitchell. Free and open to the public. We hope to see you there!